Okay, so I read this book back in January and it’s now … August. Yes, it’s about time I finish this review. My tardiness has nothing to do with the book. Much of what I read stayed with me: a sign of an enjoyable and meaningful book. Lizzie and Rosanna are cousins who share a friendship that should last forever. But when the Civil War breaks out, they find themselves on opposite sides. Lizzie joins the cause of the Union as her brother and father fight for freedom. Rosanna is swept up in the passions of the old South–and her love for a young Confederate officer. Torn apart by their alliances and separated from each other, Lizzie and Rosanna are tested by love, tragedy, and the sacrifices they must make to survive. It will take one of the war’s bloodiest battles–at Gettysburg–to bring them together again, forever changed. 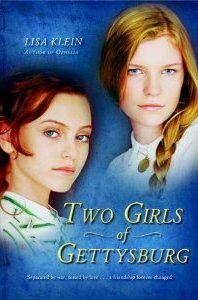 Two Girls of Gettysburg by Lisa Klein unfolds slowly. This isn’t necessarily a bad thing, although at nearly 400 words, it might put off some readers. My advice? Keep going. It’s worth it. Lizzie is a prickly narrator at first, defensive and insecure at times. Her cousin Rosanna is flighty and superficial. One thing I enjoyed about the story is how the author stayed true to the girls’ core personalities, yet showed how they changed and grew during the course of the story. The historical detail is excellent and accessible for those new to reading about the Civil War. While we do see and hear about many battles, we also get a good feel for what life was like for those not in either the Union or Confederate Army. But there’s plenty of that as well. Not just battles, but the aftermath, and conditions the soldiers (and those who cared for them) lived in. One thing that struck me was how one became a nurse. Rosanna is literally handed a basin of water and cloth and told to get busy. For Rosanna, this is a trial by fire, most definitely. And at first, she is only there because of her young Confederate officer. As the story unfolds, it turns out that this may be her calling. Likewise, Lizzy has to put her dreams of further schooling on hold to run the family business. At first resentful, she soon takes to business, if not necessarily the family one. And as the title and summary imply, the do meet again in Gettysburg and maybe they get to witness President Lincoln’s famous address. There’s a lot to like in Two Girls of Gettysburg. It’s a great place to start if you’re unsure about Civil War era fiction. It’s WWW Wednesday, as hosted by Should be Reading. In the car: Beauty Queens by Libba Bray and read by Libba. How can one woman be so talented? The audio version is wonderful. Great production values and Libba is incredible. So. Funny. I’m lucky I haven’t driven off the road. Highly recommended. On the Kindle: A Clash of Kings (Book Two in A Song of Ice and Fire) by George R. R. Martin. This is a very long book. Plus, I totally need to get myself a second middle initial. 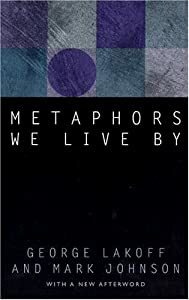 On the nightstand: Metaphors We Live By by George Lakoff and Mark Johnson For a writing class I’m taking, although strictly speaking, this is not a writing text. A Game of Thrones (Book One in A Song of Ice and Fire) by George R. R. Martin. This is also a very long book. I read, and read, and read, and my Kindle % goes up by maybe 1%. Still, it’s some good summer reading. Uh, the next George R. R. Martin book in the series. That would be the logical conclusion. I also want to read The Liar Society by Lisa Roecker and Laura Roecker. As one Amazon reviewer billed it: It’s like Nancy Drew, but cooler, sassier, and funnier. I always wanted to be a girl detective. And … speaking of reading: the Long and the Short of It review site is having their four-year anniversary celebration this week. As part of that, they’re doing a retrospective on “firsts.” On Monday, Marianne warned me that there was a surprise in my future (or rather, for my Wednesday). Guess what? Their very first short story happened to be one of mine. Shall we step back to those halcyon days of 2007–before Geek Girl was even published, never mind sold–and take a road trip out to SoCal? Don’t forget the toilet paper.